Enter Title Here – this is one crazy book about overachieving in ways that even Tracy Flick would find over the top. 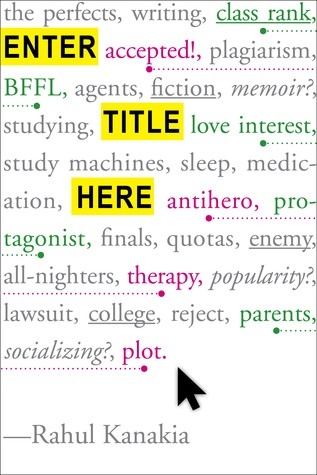 Enter Title Here – a book with enough buzz that I actually heard about the buzz. In truth, it is a buzz-worthy read. The main character, Reshma, is a real deal antihero – driven, calculating, and selfish. The tiny evil part of your soul is going to recognize her as your kindred or, if you really are that nice, you will be appalled by her. Real people, though, will probably feel both by turns. This is such a unique read – I’ve never really seen anything like it – and that means you might not love it at first sight. I wasn’t sure I loved it by the end. I do have to say, though, that it is a stunning testament to the author’s creativity. I gave it four stars. However you feel about Reshma, her story is one you will keep reading because you can’t give up the hope that, eventually, she will have that epiphany that will turn her from a monster into a functioning human. Or for the moment when her conniving and manipulation finally pays off. I’m not going to tell you whether you get those moments or not. Half the fun is seeing exactly how far this crazy train will go, and I can assure you that Reshma is the most determined character I have ever encountered (so she gives the energizer bunny a run for its money). I’m not going to tell you if she gets her just deserts or if hard work really does pay off in the end. That, too, is one of the best knots to work through in this novel. I am going to say that I thoroughly enjoyed the journey. Funny, unexpected, and unbelievably and horrifyingly honest – this is a book that digs into the dark heart of a girl with a goal and the venom and cynicism that won’t let her fall short. I would say this is a book that will appeal to fans of Gillian Flynn’s Gone Girl because Reshma is the younger, Indian equivalent of Amazing Amy. It will also appeal to anyone brimming with potential that others can’t see, folks who have ever been taken down by that ridiculous overachiever in your high school, and people who like to laugh – that should cover just about everyone. Language and situations are appropriate for high school readers.